Reasons why Android smartphone users go for iOS and then come back. iOS vs. Android has always been a burning topic for debates all over the internet. There are numerous users who have changed their Android smartphone with an Apple iPhone and later regretted their decision. In this article I’ll point out the reasons for which Android users switch to iOS and the problems they face after it. A display having pixels density more than 300 PPI(Pixels Per Inch). Apple used the term “Retina Display” for its such displays. It was said that the visual quality offered by retina display will be beyond amazing. It is true, whether you’re watching a movie, playing a game, reading a document or doing any task with your phone, the display will make working with your Apple device a visual delight. Yes! This is definitely an attractive “feature” of Apple phones and tabs. When we compare an Android device and an Apple device having similar hardware( RAM size, Processor cores etc), we quickly find out that Apple device performs far much smooth than the Android device. Android users can be seen often complaining about how installing a new game converted their phone into a brick, Apple users seldom face such situation. The camera of Apple devices is always ahead of the time. That said, an Apple phone or tab having a camera of specific megapixels will always beat the Android phone or tablet having same megapixels. Thanks to the big aperture of the camera lens, decent extra features and better image processing offered by Apple. This is not it. The list is pretty long but I’ve mentioned the major factors only. Now lets have a look at what actually comes along these features which we get for paying large amount of extra money. Actually it is expandable on iCloud only. And since Android users get used to having an option of increasing the memory just by buying an SD card, it is not easy for them to handle this surprise. So, they have limited memory, the additional stuff can be put on iCloud, which is a paid service itself. Customization is almost nothing in Apple phones when compared with Android ones. Google works extensively on its UI to make it attractive and flexible at the same time. Users can personalize their phones on drag-n-drop basis. Although Android devices too have some restrictions but the extent is very different between these two. So, if you want the freedom to change things at a level similar to Android, you’ll need to jailbreak your Apple device. If you need to lower brightness in your Android, you just open the brightness status bar and put your thumb to the desired place and the brightness is set to that level. But in Apple you have to put your thumb on the slider and then slide it to the desired position, this is damn irritating for an ex Android user. And no one knows why Apple never worked on providing affordable phones to its users. And the price always depletes to its half in two years. Most of the iPhone lovers are seen to buy an iPhone just after two or two and a half years after its launch. Well, these were the points one needs to keep in mind while switching. Above all Apple phones and tabs are amazing in their quality. And Android is affordable yet amazing. We invite your suggestions on the topic. You can give your feedback in the comments below. Many Android handset makers have shown their how-to with built-in speakers. The HTC M series for example and their front-facing speaker grille, how’s that for a good idea? Also Sony would not be Sony if they didn’t make their Experia with the best available components. As for the reason users return to Android, I’ll add one more: 3rd-party inter-applications communication: provided it’s feasible, 3rd-party apps can exchange data between each other more easily than within iOS’ walled garden. Also the touch keyboard are much more customizable even after Apple allowed 3rd-party ones. I suspect that you are not a native speaker of English. I recommend that you sharpen your English skills before publishing in the future. This article leaves out the MAJOR advantage of Android: Portability. The ability to choose from and switch among phones from a dozen different manufacturers ranging in price from around $100 all the way up to $700 and still keep your apps and contacts synchronized, and have, for the most part, the same functionality. Openness is a feature. And the iPhone doesn’t have it. At all. But really, it is a moot point because any smartphone $350 and up these days has good performance. IPhone users who switch to an Android phone and switch back to the iPhone just can’t handle the “freedom” of the Android platform and need the security of Apple’s walled garden. 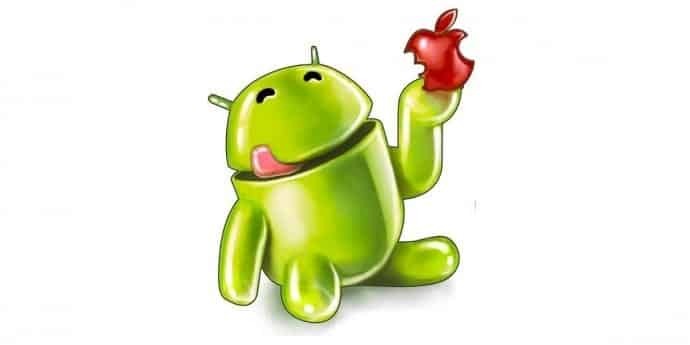 For me I prefer iOS more than android coz android is more affected by viruses than the iOS devices and about all the elegant apple logo always attract me and make me feel I am handling really a valuable gadget . Infact regarding device is, it matters a lot that how it works not how it apears and performance of Apple is awesome. After reading article i came to conclude that Apple has bearable setbacks which infact need to be understand why they are in that way. Apple has some difficulties in order to secure device health n life. Cheers, eat apple n have Apple. Apple has fixed memory, fixed features, fixed everything because of reliability. If you can customize everything your device become unstable. If you dont like apple’s precustomized design and features just switch back to android and reboot your phone three times a day.